For premium all wood kitchen cabinets that are made in the USA, the clear choice is Arkansas Wood Doors. Since 1977, our experts have been helping manufacturers find the perfect all wood kitchen cabinets for their clients. In addition, we offer a huge variety of styles and colors to choose from. Colors such as Almond, Apple Cocoa, Cognac, Dixie Mahogany, Folkstone and Fusion Maple to name a few. Our RTA cabinets come with everything you need to hang the cabinets. Items such as doors and drawer fronts, drawer boxes, hinges, and hardware as well as pre-finish options. Our Stonehenge brand has been installed in hundreds of houses all across the USA. When it comes to quality American built wood kitchen cabinets your first choice is Arkansas Wood Doors. Place your order today,for our cabinets. 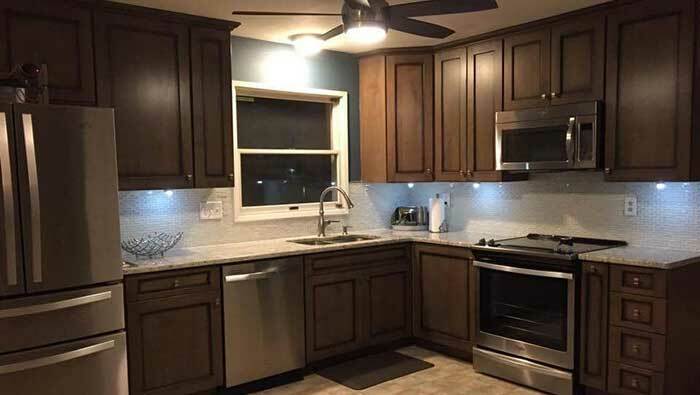 Once you have finally decided to install our wood kitchen cabinets, there are some good tips and tricks to extend the life of your cabinet. Our first tip is to clean the cabinets from time to time. No matter how hard you try, cooking can affect your cabinets. Food splatter and steam and particles from cooking always get on cabinet doors. Some soapy water made with dish soap can help clean those dirty cabinets. Deep cleaning all your cabinets once a year can help extend the life of your wood RTA cabinets. Occasionally hardware may wear out as well. Ordering new hardware to replace busted old pieces helps maintain your cabinets. Also, wax pencils and repair kits can help repair small scratches on your cabinets. If your cabinets have a stained finish, furniture oil or polish can help restore their beautiful look. These are just a few tips on how to maintain your cabinets. Also, if you have any other questions about wood cabinets give us a call at 479.968.5486 and we will be glad to answer any questions.